Governments have won the cyberwar. Their grasp chokes the citizens of every country as oppression rules the world. Then a group of hackers carved out an untraceable piece of the cyberspace and created the underground network called Neon Valley. Since then, it has become a place where both the good and the bad coexist as the last of the free. And such places always attract a need for entertainment. Thus the Neon Valley colosseum was born. Welcome to The Mainframe. 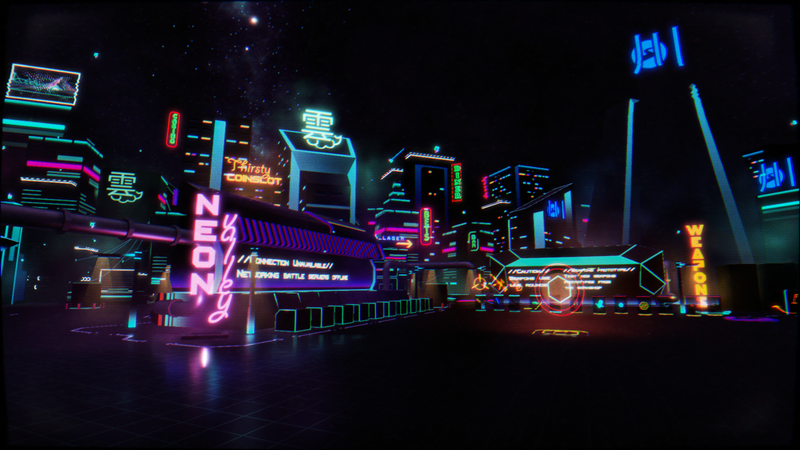 The cyberspace city of Neon Valley. The idea for this city, and in extention my game, is based on everything neo 80s. From Tron, neo tokyo, retrowave and the amazing genre that is cyberpunk. A bright visual design with magenta and cyan neon lights. I thought this challenge would be a good opportunity to make the Mainframe city I've been postponing. Neon Valley / The Mainframe from models to lighting was made by me, Jonathan Doorenbosch. Wouter De Vries worked on the cinemachine track, setting up the sequence and editing the video. The city layout is based off the motherboard of a computer. The cyberspace representation of a computer network hub. People use neural links to connect to the Mainframe. Here they can experience the full range of human stimuli digitally. So the Mainframe is a place where they fully express their skewed sense of freedom with synthesized cyber drugs. Betting or battling in the Arena. All while rocking out to the music of a bygone era. The city is a reflection of humanities folly. That even within the last place of freedom, from oppression of governments and corporations, we erect a city of corruption. The Workshop exists at its foundations, building the weapons and profiting from contracts with underground corporations. Fueling the illegal battles of the Arena. Started off with basic skyscraper shapes to block out skyline. Modeled more assets for all the key areas. Added everything to Unity and created appropriate materials, giving them colors and subtle normal maps. Designed a terrain, added monuments outside of the city area. It begins with the Workshop, architects of the Arena and its weapons. Their products are central to the economy of the Mainframe. This scene symbolizes the origin of the Mainframe, it began with the Workshop. The following shots show the fallen monuments of a previous cyber age. That once before humanity has fallen to its own devices. Now exists the Mainframe, shining in the center of this cyberspace, a new technological frontier also known as Neon Valley. Its radiant lights, flaring colors represent our final rebellion against the oppression of the governments and megacorps in the real world. However, as we enter to its center we see a city not so different to the ones outside. That here in a city representing freedom we fill it with ads, casinos and cheap thrills.